Much of the BPM literature views business process design and implementation as a top-down process that is built on strategic alignment and managerial control. While this view has enabled the design of many IT artifacts for business processes, it is inconsistent with the observation that information infrastructures, including a company’s business process infrastructure, are at drift, a term that refers to the lack of top-down management control. The paper contributes to resolving this inconsistency by developing a meta-framework that conceptualizes business processes as emergent organizational routines that are represented, enabled, and constrained by IT artifacts. IT artifacts are developed in processes of functional-hierarchical decomposition and social design processes. Organizational routines have ostensive and performative aspects, forming a mutually constitutive duality. A literature review demonstrates that the propositions offered by the meta-framework have been insufficiently considered in the BPM field. 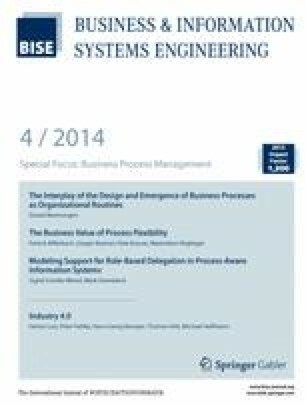 The paper concludes with an outlook to applying the meta-framework to theorize about the interplay of design projects with the subsequent emergence of business processes in organizations. Accepted after one revision by Prof. Dr. Martin Bichler. The current paper is a further development of Beverungen D (2013) On the design of IT artifacts and the emergence of business processes as organizational routines. In: 34th International conference on information systems, Milan, Italy. This article is also available in German in print and via http://www.wirtschaftsinformatik.de: Beverungen D (2014) Über das Zusammenwirken der Gestaltung und Emergenz von Geschäftsprozessen als Organisationsroutinen. WIRTSCHAFTSINFORMATIK. doi: 10.1007/s11576-014-0425-3.